Master the art of grappling and defeat Conor ahead of UFC 229. Lightweight champion Khabib “The Eagle” Nurmagomedov looks to defend his title against the “Notorious” Conor McGregor at UFC 229, and ahead of the biggest fight in UFC history, it's time to break down how to fight like Khabib in UFC 3. Learn the fundamentals of wrestling, use powerful takedowns, and avoid big shots to defeat Conor as you defend the 155 pound belt and keep Khabib's undefeated streak alive in the fight before the fight. As one of the UFC's most dominant wrestlers, learning ground and grappling controls is essential for playing as Khabib in UFC 3. Taking opponents down and utilizing effective transitions will help you unleash Khabib's devastating ground-and-pound, powered by his grappling rating of 95. Hold LT/L2 and push the right stick horizontally as you move towards your opponent with the left stick to initiate a takedown, ensuring that you're close enough to grab hold of your opponent. Depending on where you are after the takedown, you'll want to start throwing strikes from the guard, or move into a more dominant position with the right stick. If you can get Conor to the ground with Khabib in UFC 3, you'll likely be hearing “And Still!” at the end of the fight. Keeping Conor up against the cage will help you utilize Khabib's wrestling, where you'll want to use clinch controls in order to take advantage of Khabib's takedowns. Move forward with strikes using jabs, hooks, and uppercuts to keep Conor on his back foot, as you look to close the distance to where you can clinch. As you move forward, make sure you use the right stick to avoid Conor's strikes, in combination with RT/R2 to block his incoming counters. Once you're close enough, use LT/L2 and push the right stick up or down to enter the clinch, and when locked up, press LT/L2 once again to select a takedown with the right stick. You can transition in the clinch to find different takedown options that lead to dominant positions on the ground. Bringing opponents down with an outside leg trip is one of Khabib's most effective takedowns, which you can perform while away from the cage in the clinch. Performing one of these trips will lead to side control, just one of many powerful takedowns that put Khabib in a dominant position. Single-leg takedowns are a great place to start with Khabib, but keep in mind that certain takedowns in UFC 3 will lead to better positions for the Lightweight champ. Using powerful takedowns will put Khabib in side control, where he can move to even better positions like mounted crucifix by holding LB/L1 and selecting “Crucifix” with the right stick. As previously mentioned, outside leg trips from the clinch lead to side control, while moving to double under in the clinch, followed up by a body lock throw, is another great way to get to side control. The ankle pick, added in Gameplay Update #7, is a difficult takedown to deny and will lead to Khabib landing in side control where he can unload on Conor, and can be performed from longer range than a standard single-leg takedown. Once you find yourself in a dominant position, denying Conor's transition attempts by holding LT/L2 and pushing the right stick (in the same direction Conor's trying to move) will drain his energy, giving Khabib a chance to finish the fight with strikes from the guard as Conor loses stamina. While taking Conor down is going to be your main key to victory, avoiding his devastating shots is going to be equally important in defending the belt. Use the right stick to dodge, holding LB/L1 for a faster and wider evasive maneuver (at the cost of more stamina), and make sure you follow it up with a well-timed takedown. In the latest changes to gameplay, an advantage in grappling is given to fighters who sidestep their opponents' forward moving strikes, so moving out of the way of Conor's shots and following it up with a takedown will be extremely effective. From there, it's up to you to finish with ground-and-pound. 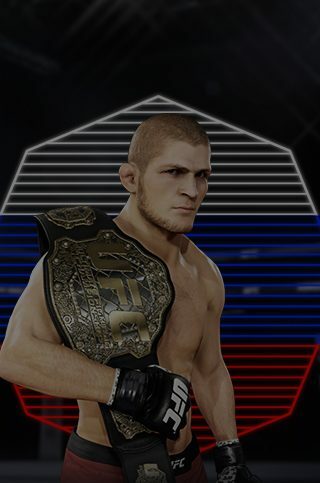 If you learn the grappling, clinch, and ground controls, keep Conor against the cage, use powerful takedowns, and avoid incoming shots, then you'll be able to keep the belt and retain Khabib's undefeated record in UFC 3. Check out how the fighters are performing in game, with daily updates based on community-driven results. Now get in there and make history.